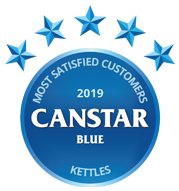 Canstar Blue’s inaugural kettle review has seen seven major brands rated on value for money, performance, ease of use, noise, design, functions & features and overall satisfaction. Compared brands are Russell Hobbs, Breville, Kmart, Kambrook, Sunbeam, ALDI and DeLonghi. Russell Hobbs has taken out top spot in Canstar Blue’s inaugural kettle review. It achieved five stars for performance, ease of use, noise, design, functions & features and overall satisfaction. After a long, hard day, there’s nothing better than sitting down with a hot cuppa. Unless, of course, your kettle is on the fritz, which would leave many of us at boiling-point. While it may not seem like a kitchen without it, the humble kettle is often underrated in the modern day household, with appliances such as smart fridges and dishwashers often taking the spotlight. Despite this, many of us still turn to the kettle for either a relaxing cup of tea, or an energising cup of coffee when we need it most. While purchasing a kettle might not seem like a big financial investment, finding one that works for your needs, as well as fits in with your kitchen aesthetic, warrants enough thought so that you don’t just grab the first one you find. So, which brand has ticked all the boxes for Aussie consumers? In our inaugural kettle review, seven brands achieved the minimum sample size required to be included, but only one came out on top – Russell Hobbs. Breville, Kmart, Kambrook, Sunbeam and ALDI all got four stars for overall customer satisfaction, while DeLonghi was last on three stars. While Russell Hobbs was rated number one, Kmart was able to secure top spot when it comes to value for money. Read on to find out what each brand has to offer, plus some general buying tips when you’re on the lookout for your next kettle. Offering a variety of modern style kettles, as well as vintage style kettles for those after that ‘old school’ aesthetic, Russell Hobbs is a well-known brand in the kitchen appliance market. It provides a number of kettle series, giving you plenty of options to consider. The Lunar series, the Russell Hobbs introductory model, is available in a variety of colours to suit your kitchen aesthetic. It has a 1.7L capacity with water gauge for easy use. The Lunar series also has quiet boil technology and a blue interior illumination feature, making those late-night drinks easier to make. With a push button lid, plus a removable and washable anti-scale filter, the Lunar series will be suitable for many households, regardless of their hot drink preferences. If you’re after a stainless-steel model, then Russell Hobbs offers its Lunar Ombre range, with similar features. If you want a certain look for your kitchen, Russell Hobbs’ Vintage range may be the kettle for you, with the stainless-steel kettle available in copper, charcoal, red, white and black to suit any kitchen aesthetic. The Vintage range has a capacity of 1.8L, making it ideal for when you have guests over, with the kettle also coming with a 360-degree base and cord storage. The Vintage range also has auto cut off boil dry technology, with a pull-off lid for easy cleaning. Russell Hobbs kettles received five stars for overall customer satisfaction, performance, ease of use, noise, design, as well as functions & features. It was a solid four stars on value for money. With plenty of kitchen appliances available, it’s no surprise that Breville has a wide variety of kettles to choose from. Whether you’re after a simple model, a stainless-steel model or a kettle with a tea infuser built in, Breville likely has you covered. Breville’s basic models include the popular Soft Top model, with the classic design coming with a 1.7L capacity, as well as a removable scale filter and plastic housing that reduces noise while heating, handy for those early morning starts. If you’re after something a bit fancier, Breville also provides glass kettles, including the Crystal Clear model, which is built with DURAGlass for safety. The Crystal Clear comes with auto shut off with boil dry protection to limit the risk of burns. For those after the latest in kettle technology, Breville also offers the ‘Smart Kettle’. Constructed with stainless steel and BPA free materials, the Smart Kettle uses five pre-programmed temperatures to tell users which temperature setting to use for certain types of hot drinks. The Smart Kettle also preserves the hot water for up to 20 minutes, which can help save that cup of tea that you forgot. Another kettle that will excite tea drinkers is the Breville Smart Tea Infuser, which includes a range of features to help you make a perfect cup of tea. The Smart Tea Infuser has a timer to ensure that you steep your tea for the correct amount of time, with temperature controls to ensure perfect drinking temperature. The Smart Tea Infuser has separate settings for Green, White, Oolong, Herbal and Black teas, with adjustable steep times for mild or strong tea, perfect for a variety of drinkers. As a bonus, the stainless-steel tea basket can be removed and is machine washable, making cleaning easy. All Breville kettles come with a 12-month warranty. In 2019, Breville got four stars for overall satisfaction, as well as most other research categories. It was an outstanding five stars for performance and ease of use. Kmart offers many cheap and cheerful kettles, with 14 options on offer at the time of writing. It boasts quality, value and contemporary designs across its full range. Expect 1.7L capacities and a wide range of colours, from stainless-steel and black, to mint and red. 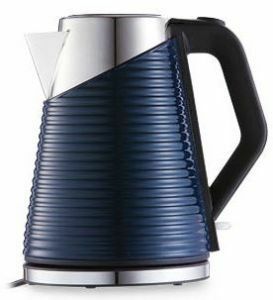 Its 1.7L Retro Kettle (pictured) is designed with an external water level indicator, dry boil protection and 2200W of maximum power. It comes in both an almond or mint colour variation. Prices start from $7.50 for the 1.7L cordless white kettle and max out at $39 for a more modern 1.7L kettles with dry boil protection. 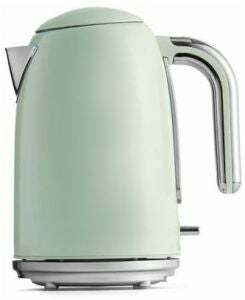 At this price range, you’ll find some of its popular retro style kettles. Kmart offers a 12-month warranty on most kettles. Kmart was rated four stars for overall satisfaction, as well as most other categories. It was a solid five stars on value for money, but just three stars for functions & features. Another veteran of the kitchen appliance market, Kambrook offers a variety of kettles for all budgets, with a range of glass and stainless-steel models available. Kambrook’s most basic model, the Aquarius, is made of tritan plastic and is BPA free, with a concealed element for easy cleaning. 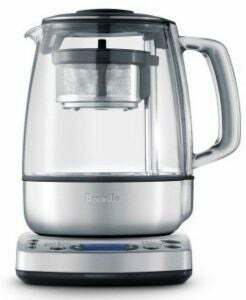 With a removable and washable mesh filter, the kettle provides a 1.7L capacity with 220-240 Volts for quick boiling, making it a handy addition in any kitchen. 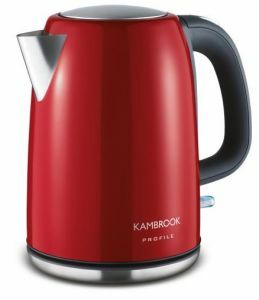 Kambrook’s stainless-steel kettle range, which will set you back around $70, has a 1.7L capacity with a cord-free multi-directional heater, handy for the modern kitchen. The model also comes with boil dry protection, along with removable and washable filters to ensure your kettle is easy to clean. 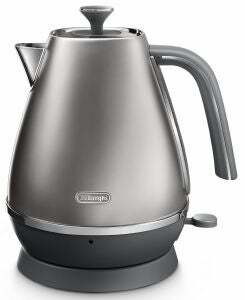 For those after something a bit bigger, Kambrook also offer a 1.8L kettle, which also comes with similar features. 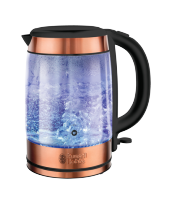 If you’re after a glass kettle, Kambrook also offers a 1.5L model, with rapid boil settings through a 220-240 voltage. BPA free and with boil dry protection, the glass model will keep you safe from germs and burns, as well as help satisfy your tea cravings. This year Kambrook secured four stars for overall customer satisfaction as well as for all other variables. 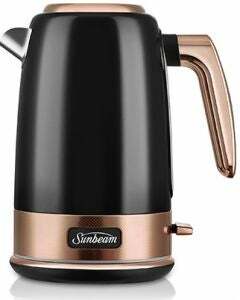 With one of the largest ranges available, Sunbeam has households sorted when it comes to hot drinks. Regardless of your needs or your budget, Sunbeam will have a model for you, ranging from traditional models to stainless-steel and glass models. The Gallerie Collection, available in a range of colours, comes with a stainless-steel finish to blend in with your whole kitchen. With a cordless base for easy use, the Gallerie kettle has a 1.7L capacity and a water window to keep an eye on the water level, and is powered by 2200W for quick boiling. Another series available in plenty of styles and colours, the London Collection has a 1.5L capacity, which is enough for six standard cups of tea. The London model uses 2400W for boiling, with the heating mechanism concealed in the kettle base to reduce scale build up. If you’re after a bigger model, the London range also comes in a more traditional 1.7L design, with similar features and safety functions. For those after glass kettles, Sunbeam has a number of different designs and models available, including the Maestro and Perfectly Pure Glass models, all retailing for under $100. All operating between 2200W and 2400W with a 1.7L capacity, the glass models contain quiet boil technology, in addition to their heat resistant glass for better safety. Some models also have a matching toaster available, perfect for those fitting out a kitchen. Sunbeam got four stars in all rated categories in 2019. ALDI has seen a number of different kettles appear throughout the year for its Special Buys, one of which is a 1.5L kettle. It’s available in two colour options – white or black (pictured). Its design features include a concealed heating element, a push-button lid, water level indicator and a 360° cordless base with cord storage for ease of use. As with most ALDI Special Buys, this kettle retails at a low of $39.99. Another kettle that has appeared in its Special Buys is a 1.7L Digital Kettle for $49.99. It was boasted for a digital base with four pre-set temperature settings, plus a keep warm function and concealed heating element. It featured a stainless-steel look with a black handle. ALDI offers a three-year warranty on all of its kettles. To get your hands on an ALDI model, you’ll have to keep an eye out on its catalogue. ALDI got four stars for overall satisfaction, as well as value for money, performance, ease of use, plus functions & features. It was three stars on noise and design. Italian brand DeLonghi has a range of kettles to suit your household style and size, with plenty of kettles to choose from. Many of DeLonghi’s kettles fit in with modern and vintage aesthetics, making the brand a viable option for many households. The Distinta Flair range, which comes in silver, blue, green and red varieties, has a 1.7L capacity and an independent base for cordless operation. With its removable anti-scale filter, the Distinta range has a three-level safety protection feature, which includes an auto shut-off for when the water is boiled, a thermal cut-off and another auto cut-off when the kettle is removed from the base for safety. The Scultura may be the option for those after a kettle with a different aesthetic, with the stainless-steel model covered in a sculpted resin for a design ‘with a difference’. The Scultura range comes with a 1.5L capacity and a detachable base for cord-free convenience, in addition to an anti-scale filter. Along with the three-level safety feature, the Scultura range also includes non-slip feet for increased safety. The biggest series in the DeLonghi range, the Icona kettle, comes in a multitude of varieties, with a colour scheme and design for any kitchen. Priced at over $100, the Icona range may not be ideal for those on a budget, but may be worth it for those looking for variety. With a 1.7L capacity with 220-240 voltage, the Icona range comes with a detachable lid and a removable pouring filter for easy cleaning. The brand offers a 12-month warranty on all kettles. DeLonghi was left with three stars for overall satisfaction, as well as for all other research categories, except functions & features where it got four stars. Price was certainly a priority for almost half of survey respondents. On average, Aussies spent $46 on their new kettles, the research found. Only 5% said they wish they had spent more money on a better kettle, suggesting most consumers are satisfied with what they got for their money. We also asked how long consumers had owned their previous kettle for, with the average life expectancy found to be about five years. Size and style came in second place in order of importance. With traditional plastic, stainless-steel and glass kettles available, consumers are spoilt for choice when it comes to preparing their next cup of tea. In addition, making a kettle the statement piece of your kitchen is easy with the abundance of different colour options on offer. Which kettle should I look at buying? While a kitchen essential, finding a kettle that suits your lifestyle and your drink preferences can be tricky, with plenty of options available, making it difficult to narrow down. While most popular brands have similar capacities, additional features such as auto shut-off, cord storage and quick boil functions are all factors you will have to be aware of when browsing the shelves. With plenty of options available, it’s always best to do your research before reaching for your wallet, as some brands or styles may fit your personal preference or household better than others, with a reliable kettle just as good as a cup of tea when you really need it. Canstar Blue surveyed 3,000 Australian adults across a range of categories to measure and track customer satisfaction, via ISO 26362 accredited research panels managed by Qualtrics. The outcomes reported are the results from customers within the survey group who have purchased and used a new electric kettle in the last 2 years – in this case, 1,075 people.